Life has suddenly gotten much better with the internet radio that allows you to play non-stop music of your choice. Last.fm is the perfect antidote to dim internet radio and the inability to splurge on the newest album at the Over-Priced Megastore. Suffice it to say that I have no idea how I didn’t know about this sooner, because the sheer logic and genius behind it surely places it next to such necessities as water and the electric lightbulb. And now the prospect of picking up a leisurely radio-listening habit as a form of alternative therapy is sounding more enticing by the minute. Last.fm is an online music community offering a radio-player that learns and memorizes exactly what kind of music you like to listen to. Think facebook, only with tunes and a brain. All you have to do is register for a free personal account, download the radio installer, and you’ll be connected within minutes. 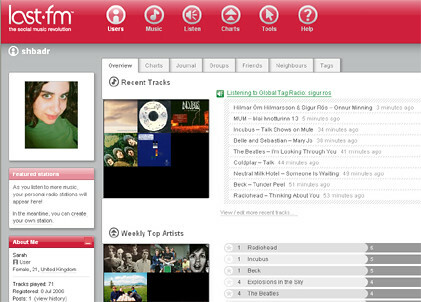 The clean, user-friendly interface is simple to use, allowing easy access to the Last.fm community in which you can join groups, participate in forum discussions for your favourite artists, send messages to fellow users, and build up charts tracking your musical leanings. One might ask why such a great service is for free in an age when file-sharing suits are mighty trendy in the world of litigation, but make no mistake: this isn’t a file-sharing network. It can almost be described as an open market for artists to promote their music–a musiconomics of supply and demand. And if there’s a song you can’t stop listening to, you can purchase it either online or at your nearest music dealer. The music that plays is only governed by the stations you listen to (and there’s no shortage of options to choose). You can skip to the next track, ban the ones you never want to hear again, and tag the ones you absolutely love. Whatever strikes your fancy will appear in your profile, and actually helps you find more music you’d like to listen to. So is this the music listener’s holy grail? Well, if you’re on a tight budget or simply like to listen to a large variety of music, then this is probably it. For someone like me whose musical taste stretches from grunge all the way to ambient (I have twenty tags so far for my most listened-to genres), Last.fm offers endless opportunities. So farewell to the days of scrambled illegal downloads, dodgy CD-copies, and three-second samplers on Amazon. Radio heaven is now accessible to all. For more on Last.fm, see what Wikipedia has to say about it.